The Reports module allows you to run and modify all reports in LOCATE, as well as upload custom reports. For more information about each report LOCATE has to offer, continue here. View and edit all report parameters and display options to run a report. You may save your selections as a Profile to run the report again in the future with the same parameters and display options. View the report name and description. You may create and manage the report groups and associated reports, which appear in the navigation panel on the left. You may associate reports to modules for quick access as well as make them the default report for a particular module. View and update any subreport files associated to the report. This sub-tab allows you to upload and download any pertinent documents you wish to associate with a report. For example, report files, images, or reference documents. See our Documents page for instructions on how to upload and download documents in LOCATE. View previously saved profiles and assign the default. The Access Control List (ACL) may be managed for individual reports. For more information about modifying ACLs, please continue here. The Schedule tab allows you to set up email events to have a report automatically generated and sent to an email address on a specified schedule. Select the profile to use when running the report. See Dynamic Date Ranges for using common date ranges such as Current Day or Current Month. Select or enter the email address to which the report should be sent. Select the filetype for the report generation. Once the report schedule is created, you will see it in the list under Scheduled Report Run. You can edit the frequency on any scheduled report run. You can also delete any scheduled report run. The Actions drop-down menu will only be available if the report is custom. Delete Report - This will remove the report from the Reports Module, and any modules to which it was associated in LOCATE. Dynamic date ranges allow you to easily select common date ranges from a dropdown list, including Current Date, Current Month and Current Year-To-Date. Simply select the option you need for the report. To use Dynamic Date Ranges with report scheduling, save a profile with the date range type selected, and the scheduled report will always use the current applicable time frame for that date range option. If you need to select a custom date range, select Custom Range from the dropdown option and you'll be prompted to enter start and end dates. This type of filter is designated by a "+" icon, and allows the user to select multiple records for which to run the report. Each record selected will be listed next to the filter. Simply click the "x" icon to remove any selections from the list. The wildcard filter will search for items containing the string of characters entered. For example, searching for "ABC" will return results such as "123ABC", "ABC123", or "12ABC3". Invalid Wildcard Characters - Apostrophes. You may run a report from the Reports module, or any module that the report is linked to. For more information on linking reports, see below. IMPORTANT: When running a report as a .CSV file through Google Chrome, there is a known bug in Chrome that removes the file extension from the download. You will want to add ".csv" to the end of the file name prior to opening it. If you select to view all display options, there may not be sufficient room on the report to accommodate all fields, and you will need to narrow the display options. If you need to view all of the data, please contact us to discuss custom report options. Using the search bar or report groups, navigate to the report you would like to run. Click the Report Parameters header to expand the section, and select the appropriate data you would like to run within the report. Note that any required parameters will be flagged with an asterisk (*) and must be completed to run the report. Click the Display Options header to expand the section, and select the visual aspects you would like to see on the report. If you would like to run the report in a different file format, click Run As and select the format you need. In the module linked to the report, click the Reports sub-tab menu. 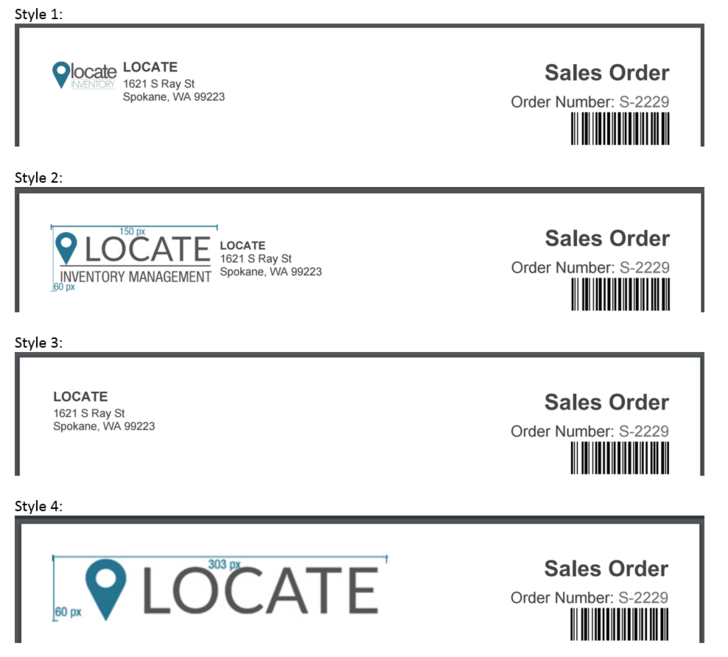 If you are on the object detail page and the report requires a record number such as sales order number, it will automatically run for that particular sales order. If a report is pulling a high volume of complex information from the database, it may require additional time to complete. You may choose how long to run a report before it begins to run in the background. LOCATE will prompt the user to choose a delivery method by which to receive the report upon completion. This allows the user to continue using LOCATE while the report runs. Prerequisites: You'll want to set the Report Run Cutoff setting in your LOCATE Report Settings. Email - This option will send a link via email to download the report. The email goes to the user's default email address. Pop Up - This will display a pop up type notification in the lower right corner of the LOCATE interface, which will contain a download link for the report. Note, this type of delivery method will not appear in the Notification Center. Report links are available for 72 hours after the report has been ran. If the user does not choose a delivery method and simply closes the window, LOCATE will display a pop-up notification and display a message in the Notification Inbox. Once a report has been ran in LOCATE, it may be quickly emailed directly from the Reports Module. Navigate to the Reports module and run the report of your choice. See section above for steps on how to run reports in LOCATE. Once the report generates, click Email Report in the upper right corner. Template - If there is an email template that you would like to use, select it here. From and To - Select the email addresses from which and to whom this email should be sent. You may add a CC and BCC with the corresponding buttons below the To address. Subject - Enter the email subject here. Complete the body of the email and add more attachments as desired. A PDF of the report will be pre-attached. You can also set up email events to have a report automatically generated and sent to an email address on a specified Schedule. If you would like to run a report with the same report parameters and display options, you may save a report profile to quickly load those selections. Navigate to the report for which you would like to create a profile, and click onto the Report Run sub-tab. Select the report parameters and display options you would want to use. Enter the report profile name and description. If you would like these settings to apply to the report automatically, you may flag a default report profile. Report groups are the sections displayed in the navigation bar on the left. You may create and edit these groups. Navigate to any report in the Reports module. In the Categorize Report section, enter a new group name. Note: The report you selected will be automatically added to the report group you create. See below for instructions on how to add or remove a report from a group. You may rename report groups by editing them. In the Categorize Report section, find the name of the group and click Edit Group. Navigate to the report you would like to add or remove from a group. Add Report - Click Add to Group. Remove Report - Click Remove from Group. In the Categorize Report section, find the name of the group. Click the Edit drop-down menu, and select Delete Group. Navigate to the report you would like to link. In the Module Linkage section, click Link to the right of the module to which you would like to link the report. The icon will turn red and read, "Unlink". To unlink, simply click the button again and it will go back to blue and read, "Link". In order to make a report default, it must first be linked to the module. Navigate to the report you would like to make default. In the Module Linkage section, click the Unlink drop-down menu to the right of the module for which you would like to make the report default. There are four styles with which to display your company logo on reports, which are stored in the Services module within the "LOCATE Jasper Report Server" service. This report header setting is company-wide and will apply to all reports within LOCATE. Note: you will want to ensure that you have uploaded the correct image size on the company page in the Settings module. Use the column headers to find the "LOCATE Jasper Report Server" service, and click the service name link. To see an example of each logo, as well as the required logo sizing click here. Once you've chosen the style you'd like to see on your reports, change the Header File Path field in LOCATE with the corresponding file path text from above. Note: each file path is identical except for the number, so you may simply change the number. Navigate to the report you would like to delete in the Reports module. Open the Actions menu and select Delete Report.